'TRAINING' By AIDAN TRIMBLE. 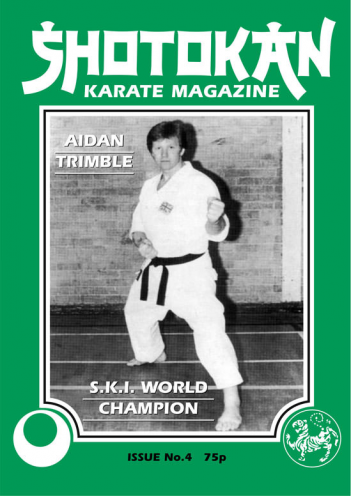 SKI WORLD KUMITE CHAMPION. SPORTS NUTRITION. By Bernard Beverley. INSTRUCTORS SPOTLIGHT. MALCOLM PHIPPS 3rd Dan SEISHINKAI. THE STUDENT TEACHER RELATIONSHIP. By Vince Morris. CLUB PROFILE. SALFORD SHOTOKAN CENTRE. DIRK HEENE (BELGIUM) SHOTOKAN TRADITIONALIST. SHOTOKAN COMPETITIONS, COURSES & REPORTS. In this issue we feature a current champion, namely the S.K.I. World Kumite Champion Aidan Trimble and a former champion, Dirk Heene, of Belgium. Both men are not only first class karateka but very down to earth and unaffected people who both come from a traditional training background. Aidan being a student of sensei Asano and Dirk Heene a student of sensei Miyazaki, the J.K.A. instructor resident in Belgium. Dirk has also trained extensively with sensei Taiji Kase the J.K.A. instructor in France. No apologies for featuring Billy Higgins again and also another fine article by Vince Morris. Billy shows a 'Fighting sequence' and Vince writes about the relationship between a student and his instructor. The supplementary training and technical articles which we have published in S.K.M. e.g. Sprinting - Weight training - Physics etc., have been very well received and this time the subject is sports nutrition written by an expert on the subject, Bernard Beverley. SKM coverage of training courses seems to be very popular with all our readers and in this issue there are more training tips and ideas from instructors, Steve Cattle, Dave Hazard and Paul Mead. All former British Champions who now pass on their knowledge and experience to Shotokan students throughout the country. If you haven't had the opportunity to train with instructors of this calibre, then hopefully through the pages of S.K.M. you can learn from what they have to say and the type of training they do.